Loss of supply flexibility from the Rough storage facility remains a structural threat to the UK gas market and is likely to support gas price volatility. The UK gas market was hit by a major shock in July in the form of an extended outage at its largest gas storage facility. The immediate impact of Centrica Storage Limited’s (CSL) suspension of injections at the Rough facility was a spike in winter gas prices. Winter prices eased again last week as CSL announced that it would bring back the majority of Rough wells online, allowing existing gas in store to be withdrawn from November. Rough accounts for more than 70% of the UK’s working gas volume. It is a seasonal storage asset with a relatively low cycling rate. But the scale of storage working gas volume means Rough plays a key role in providing supply flexibility to the UK. Rough is also large enough to be important in a broader North West European market context. 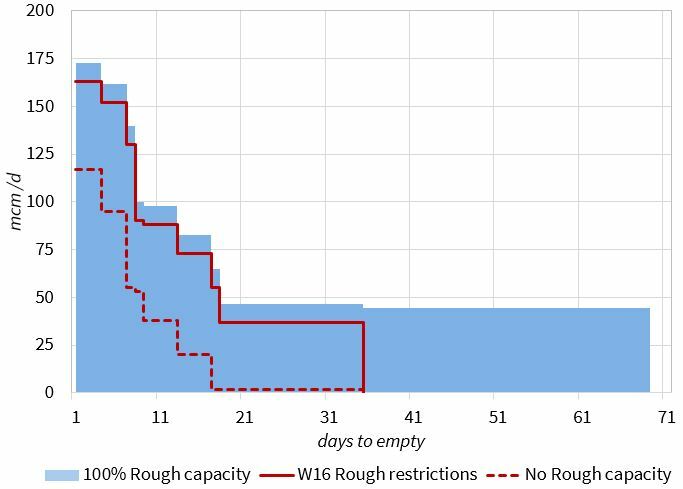 The curtailment of Rough does not create a significant seasonal flexibility issue in the UK market. But it does exacerbate the UK’s gas deliverability issues. During periods of high demand or supply outages, the UK can face constraints in delivering enough gas into the network to meet demand. It is the loss of Rough’s deliverability, rather than working volume that poses a problem for the UK market. The market may have breathed a sigh of relief last week as CSL’s announcement alleviated worst case fears for the coming winter. But the potential loss of Rough capacity remains a structural threat for the UK gas market. 18 March 2015: routine inspection identified ’a potential issue with well integrity’ and resulted in a 25% potential reduction in working gas volume from 3.7 bcm to 3.1 bcm. 22 June 2016: a full shutdown was announced for 42 days due to a containment envelope failure in one of the wells at a lower pressure than expected. This was discovered during the testing programme prompted by the March 2015 outage. 15 July 2016: the full shut down was extended until March / April 2017. CSL stopped selling capacity (SBUs) for the 2017/18 storage year but is investigating the possibility of making some wells and limited withdrawal capacity available over winter 2016. 4 August 2016: scenario curves released by CSL indicate that it believes that Rough will be able to meet a minimum withdrawal rate of 6 mcm/day (vs a 42 mcm/day flow rate at full output). 22 August 2016: CSL announced that it expects 20 wells (of a total of 30) to return to service by Nov 2016, likely to support a maximum deliverability of around 35 mcm/day. The chart illustrates the daily volume of gas deliverability (vertical access) assuming maximum rate withdrawal from full inventory over time (horizontal access). Rough as a slow cycle seasonal facility sits at the bottom of the chart. Despite Rough’s dominance of UK working gas volume, its slow withdrawal rate means that it contributes proportionally less to UK deliverability (and takes a long time to empty). Faster cycle storage facilities (such as Holford, Stublach & Aldbrough) sit higher up in the chart. These provide much higher deliverability relative to working gas volume, but empty more quickly. So estimates of headline withdrawal rates (and the solid red line in Chart 1) are likely to overstate the deliverability that Rough will be able to provide this winter. Rough is also constrained this winter by the fact that current inventory levels are a third of normal levels (1.26 bcm vs 3.73 bcm at the start of last winter), due to the injection restrictions. This leaves the UK market significantly exposed to any more prolonged periods of system stress (e.g. as was seen in 2013). The partial availability of Rough for the coming winter may have calmed the market temporarily. But the bigger issue facing CSL is that revenue from current seasonal price spreads is unlikely to support the lifetime renewal capex required to maintain Rough operation. This leaves the UK market contemplating the red-dashed line in Chart 1. Visually the biggest impact of the loss of Rough capacity is the reduction in the number of days of gas in store (comparing the blue shaded region with the red-dashed line). But the UK market’s vulnerability is actually focused on the volume of deliverability over a shorter 2-3 week period, i.e. on the left hand side of the chart. A loss of Rough capacity decreases the UK’s daily deliverability of gas from storage by almost 25%. This can be seen via the red dashed line (0% Rough) intersecting the vertical access 42 mcm/day below the blue shaded region (100% Rough). And it is this threat of loss of deliverability that is of most concern to the UK market given its vulnerability to periods of system stress e.g. a cold snap or infrastructure outage. Well interconnected: There is more than adequate import capacity to bring gas into the UK (e.g. via the Norwegian Continental shelf, the BBL and IUK interconnectors and LNG terminals). But there can be significant supply chain lead times to attract adequate volumes of gas imports, particularly for LNG. Deliverability squeeze: The UK market is most vulnerable to a shortage of deliverability over a 2-3 week horizon, as a result of high demand and/or supply disruptions. A classic example of this was in Mar/Apr 2013 when cold weather, field and interconnector outages caused an NBP gas price spike for several weeks, eventually alleviated by the diversion of LNG cargoes in response to higher prices. If the UK loses Rough capacity it will have a knock on impact for the utilisation and value of other storage assets. Other storage facilities will likely operate to a more seasonal pattern to backfill loss of Rough capacity. This in turn reduces the volume of deliverability flexibility that the UK market has to dampen price fluctuations. In other words it supports prompt gas price volatility and the value of faster cycle storage capacity. This is a dynamic that is likely to support gas volatility across the European gas market. Rough is not alone. It is only one example of ageing European flexible gas supply infrastructure. Around 5% of European storage capacity has been closed this decade. There is also the prospect of significant declines in supply flexibility from maturing gas fields (e.g. Groningen and Troll). As these factors come into play they are likely to drive a recovery in the market price signals required to support the economics of incremental flexible supply infrastructure, particularly prompt gas price volatility. It is unlikely that large volumes of new seasonal storage capacity will be developed. The supply flexibility requirement in the European gas market is evolving with increasing interconnection, growing market liquidity and the more flexible use of gas-fired power plants to support intermittency. These factors all point towards the increasing importance of deliverability (versus seasonal flexibility). And this is likely to mean a shift in focus towards faster cycle storage assets, LNG import infrastructure and demand side response.